Dana was a consistant winner after the track reopened. 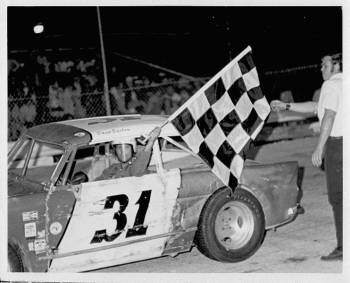 The Gary Smith Memorial was the biggest race of the year. 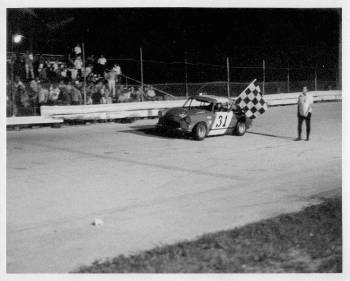 Dana is shown here after winning the 75 lap modified feature. 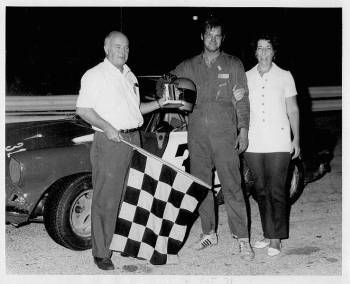 Gary's parents join Dana in victory lane. supporter at a time when the class was new, and helped it to spead across the state. Feature action! 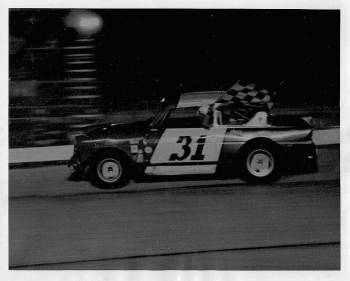 Clark Little leads the way in his Fiat 850. Barlow works the outside of George Sweeting. insists that George drove it that night. 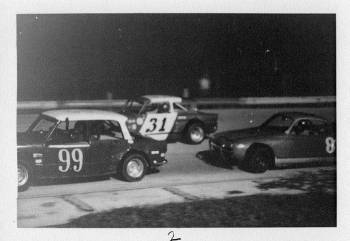 (Photo by Don Winchester) Nov. 7, 1971 Dana is on the move as a lapped car appears. 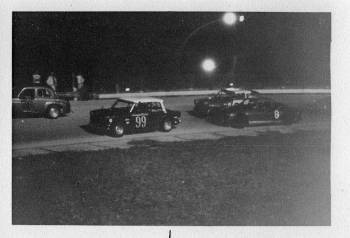 It is John Ray driving the #76 Triumph. Oops! 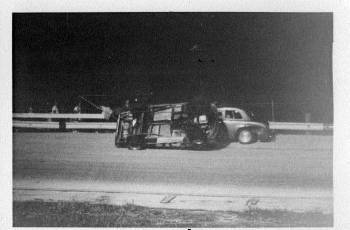 Dana rolls after tangling with the 76. 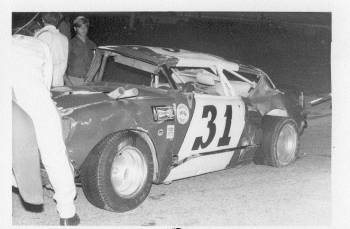 There is a Sunday race at Hollywood in just a few hours, so it is off to work on the 31! After an all-nighter, Dana is on track for some road race action. Halloween night and the winning ways continue. 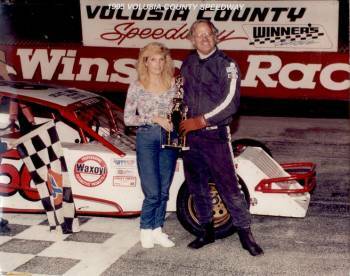 Dana Barlow spent a long career racing late models and mini-stocks. 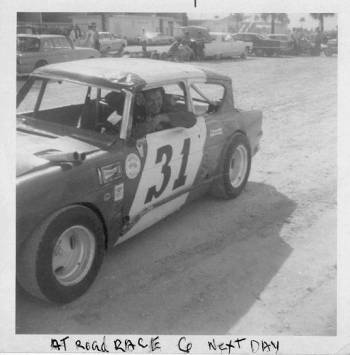 Most recently, he helped to introduce the Pro-4 division in the state of Florida. 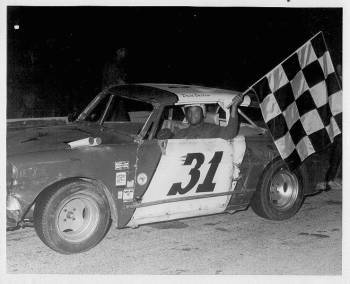 He is shown here after one of his many wins driving a car owned by Harold Perry. Some sort of California TQ? Going over the falls in a barrel? Not hardly. This was one of Dana's entries in the human powered vehicles contest at Indianapolis Motor Speedway. 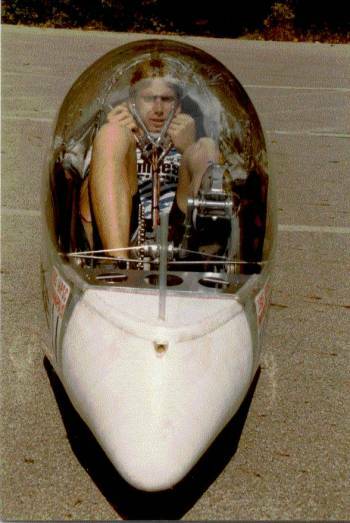 In 1985, this was the 7'th fastest cycle in the world at 51 MPH.